Splits the video signal from your PC's DVI port to 2 DVI-enabled monitors for simultaneous display of the same image. Supports video resolutions up to 1920 x 1080 for clear, high-quality images. Splits the video signal from your PC's DVI port to 2 DVI-enabled monitors for simultaneous display of the same image. DVI-D male connector splits to 2 DVI-D female connectors. 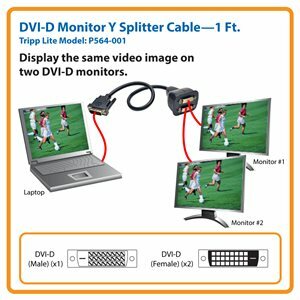 What's Included DVI Dual Link Splitter Cable; DVI-D Male to (2) DVI-I Female Cable - 1 ft.
Tripp Lite’s P564-001 DVI-D Y Splitter Cable splits the video signal from a single DVI port on a computer to two different displays simultaneously. For better viewing of presentations, attach the monitor or TV DVI-D cables to the P564-001’s DVI-D female ports and the DVI-D male plug to a computer. This one-foot cable supports video resolutions up to 1920 x 1080. Note: When connecting two different monitor models, the P564-001 will default to the model with the lowest video resolution. The P564-001 is compatible with any PC or Mac equipped with a DVI-D video output. It’s designed for short-distance applications. For long-distance video transmission, choose Tripp Lite’s B140-002 or B140-004 DVI over Cat5/Cat6 video splitters. The P564-001 is manufactured using top-quality materials. Premium double-shielding provides maximum EMI/RFI protection and superior signal quality. Its DVI-D connectors feature integral strain relief for durability and reliability. In order for video to be properly displayed, the video source must contain a DVI-D or DVI-I female PC card connector and the monitors or televisions must be DVI-D enabled. The P564-001 is designed for two DVI-D monitors to be connected at the same time. If only one monitor is connected, and the other DVI-D female port is left open, video quality will be negatively affected. The P564-001 comes with a lifetime product warranty. It’s manufactured in compliance with strict RoHS specifications, reflecting Tripp Lite’s commitment to environmental responsibility. P564-001 DVI-D Monitor Y Splitter Cable, 1 ft.